Swansea was once Sweins eg or ey, which means Swein's island. The island stood in the mouth of the River Tawe, hence the Welsh name Abertawe. Who Swein was is not known for sure but he may have been a Norseman who built a fort on the island about 1000 AD and used it as a base for raiding the Welsh coast. The town of Swansea was founded in the early 12th century when the Normans conquered the area. The Norman lord built a wooden castle on the site of Worcester Place. (It was rebuilt in stone in the early 13th century). A town soon grew up by the castle. The garrison of the castle provided a market for the townspeople's goods. Many of the townspeople were English immigrants. At some time between 1158-84 Swansea was given a charter ( a document granting the townspeople certain rights). A second charter was granted by King John in 1215. By the 13th century Swansea was a flourishing town although it would seem tiny to us with a population of about 1,000. However towns were very small in those days, especially Welsh towns. Swansea was probably fortified with a ditch and an earth rampart with a wooden stockade. In the early 14th century this was replaced by stone walls. However the defences did not prevent the Welsh burning the town several times (the last time was in 1402 during the rebellion of Owain Glendower). Yet whenever this happened Swansea recovered. In Medieval Swansea the main industries were leather and wool. In the town wool was woven. It was then fulled, which means it was cleaned and thickened by being pounded in a mixture of water and clay. Wooden hammers worked by watermills pounded the wool. It was then ready for dyeing. There was also a shipbuilding industry in Swansea. Leather and wool from Swansea were exported to England so were hides, butter, cheese and grain. In Swansea there was a weekly market. There were also 2 fairs. In the Middle Ages fairs were like markets but they were held only once a year. People would come from all over South Wales to attend a Swansea fair. Swansea was run by an official called the Portreeve. By the 14th century the Portreeve was assisted by 12 Aldermen. An Alderman was a member of a town council who had been appointed to the position of councillor for life. Like all towns Swansea was devastated by the Black Death of 1348-49 which may have killed half the population. In this period Swansea grew rapidly. It still only had a population of about 1,000 in the mid 16th century but it grew to about 2,000 by the mid 17th century. The port grew busier and busier as coal mining in South Wales boomed. Increasing amounts of coal were exported from Swansea. By the 17th century iron was also exported from Swansea. Shipbuilding continued. So did the wool weaving industry. Swansea was also noted for making gloves. By the 16th century Swansea had 3 fairs rather than the 2 of the Middle Ages. In 1655 Cromwell said it was 'an ancient port town and populous, situated on the coast towards France, convenient for shipping and resisting foreign invasions'. 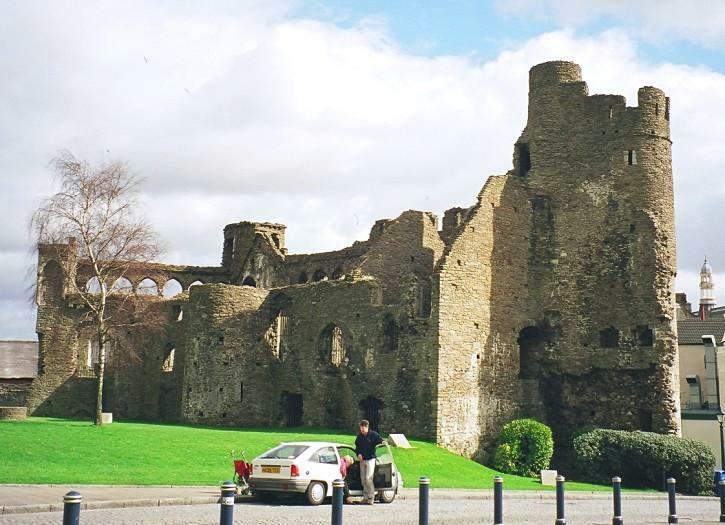 Swansea castle had been damaged by Owain Glendower in the 15th century. It was finally demolished by the parliamentarians in 1647 to prevent it ever being used by the Royalists. In 1682 a grammar school was founded in Swansea. By the middle of the 18th century Swansea probably had a population of about 3,000. It was a busy little port and market town. In 1771 Swansea gained its first bank and in 1785 its first theatre. In the late 18th century Swansea began to boom. From 1716 copper was smelted in Swansea. In 1755 a lead works opened. In 1764 a pottery plant was founded. Pottery became an important industry during the 19th century. From 1777 zinc was made in Swansea. In the 19th century Swansea became a centre of the metalworking industry. Vast amounts of zinc and copper were made there then exported through the port. After 1845 tinplate was made in Swansea. (Steel covered in tin). By the late 19th century the tinplate industry was booming. The port also boomed. It was helped by Swansea canal, which made it easier to transport heavy raw materials to and from the port. In 1791 a group of men called the Harbour Commissioners was formed with responsibility for the harbour. North Dock was built in 1852. It was followed by South Dock in 1859. In 1881 Prince of Wales Dock was built on the east bank of the Tawe. There was still a shipbuilding industry in Swansea in the 19th century but it less important than the metal working trades. The population of Swansea boomed. In 1801 it was 6,831 but by 1841 it was over 16,000. by the end of the century it had passed 100,000. Like all 19th century towns Swansea, was overcrowded, dirty and unsanitary. There were outbreaks of cholera in 1832 and 1849. Nevertheless there were some improvements in Swansea in the 19th century. In 1808 a dispensary opened where the poor could obtain free medicines. In 1809 an Act of Parliament formed a body of men called the Paving Commissioners with responsibility for paving, cleaning and lighting the streets. In 1821 Assembly Rooms were built where the well to do could play cards and hold balls. In 1821 Swansea obtained gas street lighting. Then in 1835 Swansea local government was reformed. Swansea was made a borough with a mayor. Swansea museum was founded in 1835. A general hospital was built in 1864. The first public library in Swansea opened in 1871. Victoria Park opened in 1887. By 1901 Swansea had a population of 134,000. Gynn Vivian Art Gallery opened in 1911. In 1906 the first council houses were built in Swansea. More were built in the 1920s and 1930s as the council demolished slums. Many more were built after 1945 as well as a large number of private houses. A new Guildhall was built in 1934. Swansea suffered severely in the bombing raids of the Second World War. In all 387 people were killed in Swansea and the heart of the city was destroyed. It was rebuilt in the 1960s. In the early 20th century the port continued to flourish. Kings Dock was built in 1909. Queens Dock followed in 1920. At the beginning of the 20th century the tinplate industries was booming. so were the steel and copper industries. However they suffered severely in the depression of the 1930s and there was horrifically high unemployment in Swansea. The local economy boomed again during World War II but after it ended the traditional metal working industries nosedived. Coal mining in the Swansea area disappeared by the end of the 20th century. The council tried to diversify industry in Swansea by building new industrial estates including one at Fforestfach in the late 1940s and another at Cwndu in the 1960s. Swansea is still a busy port. The South Dock closed in 1969. It was opened as a marina in 1982. From the 1920s oil was imported into Swansea. Oil was refined and the finished product was exported from Swansea. In 1969 a ferry service to Cork began. In 1969 Swansea was made a city. A leisure centre was built in 1977. Also in 1977 a Maritime and Industrial Museum opened. (It is now closed and it is planned to replace it with a Waterfront Museum, due to open in 2005). The Quandrant Shopping Centre opened in 1979. County Hall was built in 1984. In the late 1980s a shopping and leisure centre was built at Parc Tawe on the site of the North Dock. The centre included a bowling alley and cinema. Plantasia opened in 1990. Parc Tawe Centre was extended in 1997. Also in the 1990s Castle Square was redeveloped.